In other words, I spent Friday through Sunday pinch-hitting as yarn shop staff at the Purple Purl, and it was great fun. Turns out I am also at least moderately capable of minding a cash register and making lattes, and I gained a bit more of a sense of what it is like to be behind the scenes in yarn world. Everyone shops an LYS a bit differently, with different yarns and patterns (or not) in mind, and it was a great learning experience to be on the shop floor like that. These are her leftovers socks – everyone who saw them wanted to know what she was doing because they were turning out just that awesome. She is making these with her leftover sock yarn, doing chunks of colour, then alternating 2-3 rows of two colours in the transitional points of switching to a new colour, and so on. They were awesome. She said she has plans for other colour combinations based on her leftovers. She inspired at least one other shopper to buy hat-making yarn to do the same approach, I can report. It does make one wonder what treasures might be waiting at home in the stash, even in the baskets of oddballs. Don’t discount the odds and ends, man, they’ll surprise you. Happy Tuesday! And happy knitting as always. Am I the only one who feels work gets in the way of knitting, especially in December when there are so many other things that vie for the knitters’ time? Mmmm, Kureyone 95. Good colour, good colour. Love those socks, dead cunning. Knitters are so amazingly creative. Glenna, I am so envious of your experience as a worker in the yarn shop. How much did you love getting people set up with fun and beautiful projects? 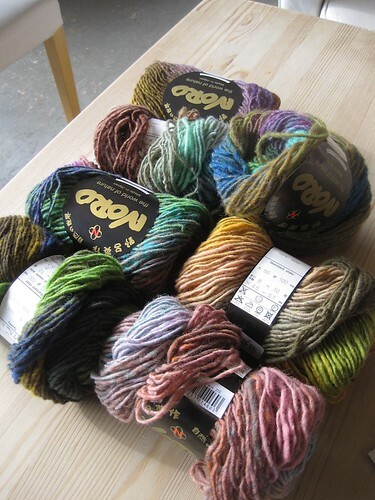 Also, the Noro looks so delicious! Also, when I read your posts, I feel like I am in a glass of champagne, the effervescent bubbles of your enthusiasm lift me up! Thanks! Bonnie, I am in your club! I always feel like everything gets in the way of my knitting including sleep, showers, and sustenance. I love the sit and dream about the FO as I work, don’t interrupt my bliss!!! Thanks for sharing your adventures. Those socks are giving me ideas- which make me want to abandon all current wips. Must resist fantastic new knitting idea- at least until January! I may finally have been out of the retail world long enough to contemplate some day maybe working at a yarn shop without getting the shakes. The reason being that most small yarn shops have pretty awesome customers AND staff/management, at least from what I’ve seen around me here in Mpls. Then again, that might be the wool fumes talking. 😉 Good luck with the holiday knitting! It sure sounds like you had a fun time at the your LYS! I’m also doing two pieces of gift knitting (well, three if you count the socks as separate pieces). It definitely was fun working the shop that weekend, inspiring and enabling others…. I never thought of merging my leftover yarns in that way. She has made a wonderful transition of color. I usually double and triple up yarns to make chunky yarn hats. Great idea!! That is really clever and very pretty – thanks for sharing both Glenna C AND Jen!! (And I’m thinking that doing 2 at a time would totally get rid of my second sock syndrome), And lattes to boot Glenna? You rock girl! I have been ignoring my yarn ends. I think I’ll have to dig through the box and reevaluate them. I hope you are the boss of your knitting too. My holiday knitting list is short this year, so it looks like I may come out on top. Those socks are really cool! I would never have thought to do that. It’s nice to hear you confess to some last minute December gift knitting too! I decided to start a sweater for my niece (she’s only 9 months, so it will be thankfully small!) a couple of days ago. It’s my first top down sweater, and I really hope I get it done in time, though if I don’t, her birthday is in March, so I suppose I could save it for then. Those socks are very cool!! what a great stash busting idea. I bet you were awesome at the PP on the weekend, I wish I had stopped by! These socks are nice! I’ll have to try knitting two socks at the same time someday and use up my leftover yarn! Bahaha! Was the person who bought the yarn for the hat with the idea of blending it like the socks me? If so, Jen C can take the credit…she suggested it. in any case, I haven’t quite made up my mind and it’ll have to wait until the new year as a reward for finishing the xmas/test knitting that’s on the table right now. I really enjoyed visiting my LYS and seeing your smiley self 🙂 I know it’s not quite using your PhD skillz but for what it’s worth, you could totally make it as a shop employee! Having worked inretail, I know it’s not as easy as it looks, especially when it’s in such a specialized shop! Also, “I’m going to show the knitting who’s boss. (I hope it turns out to be me. )” made my day. I’m still giggling about that sentiment as it is exactly how I’m feeling at the moment. Ditto!! 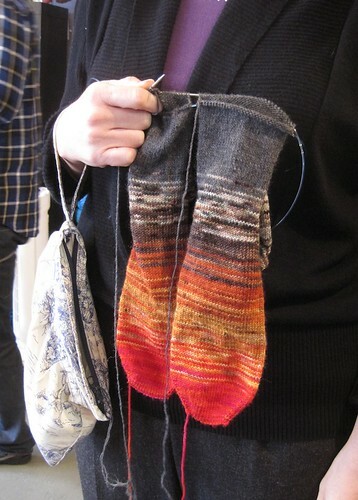 I’ve always thought I’d like to wander an LYS, touch, and advise… I DID make leftover socks and they are the best EVER! My daughter immediately took them off me. I used 6 different colors and they were super (http://yarnandivories.blogspot.com/2011/04/left-overs.html). They were super fun to see them evolve. Thanks for the December well-wishes, and hope you, too, get all those end of year projects completed. LOVE those socks! I have a basket of leftover sock yarn next to my knitting nest that I can see used in this kind of project! I just have to figure out how to do that top-down-one-at-a-time. Wow! Such a cool technique! Makes me wanna go home and try it! Thanks for the pictures. Awesome knitting! What size needles was she using? I love the socks! I will have to try that. I made a garter stitch sweater with lots of leftover yarn for my son and it turned out better than if I’d done the suggested 3 earth tone colors in repeating stripes. The world needs more color!